1) The player controls the game You can ask pretty much for anything, the dealer will give you an enormous range of bargaining options, from the dice to the bets you can make. They will make you lay your money in the way you feel is better for you, even if it means turning the table upside down. 2) Lower House Edge: Many of the bets have a casino advantage of less than 2%. Some of the more popular bets are pass line with maximum odds, don’t pass with maximum odds, come bet with maximum odds, and don’t come bet with maximum odds. This lower edge on the casino side is what you are looking for. Take advantage of it..
3) A lot of money in little time You can increase your money by 900% in just two rolls. Bet just one dollar on the two or twelve. If it wins you get $30. Let the $30 ride and if it wins you get $900. You’ve turned $1 into $900 in less than a minute! It’s highly unlikely, but where else can you possibly win this kind of money in such a short amount of time? 5) You get to win if you’re next to the right people: Make money just by riding along with a good shooter. Look for anyone who rolls small while he’s not on the dices but goes big when he is shooting. Whatever reasons there may be, one thing is certain: when he bets, you should bet the same way he does. When he wins, you will also. Get familiar with the game, play it, enjoy it and make it a mandatory activity for your casino nights. 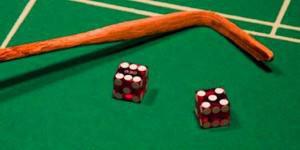 Craps is made for those looking for easy, fast excitement. This game is neither boring nor dull. If you’ve tried craps and ended up loving it, tell us how that happened in the comments section below.